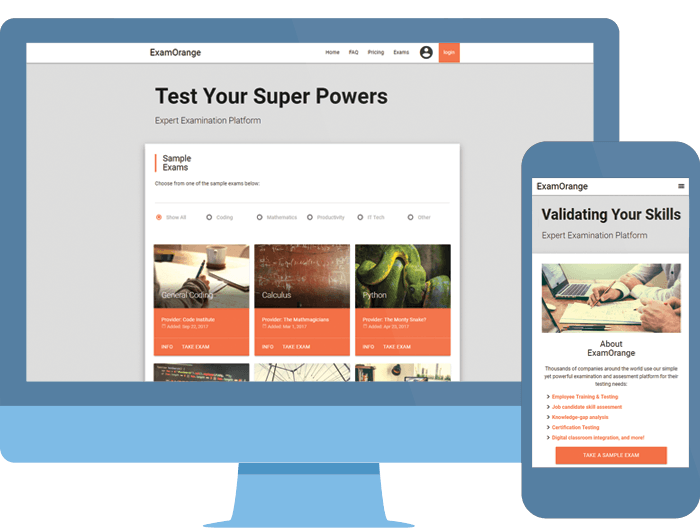 ExamOrange is a Single Page Application for a general purpose quizzing or examination web application. It can be used for skill assesment, training, certification exams, mock tests, gathering data, or just surveys. It is built on AngularJS framework and uses JSON data to generate exam questions and answers. The site is styled with MaterializeCSS. It relies on two-way data binding and AngularJS directives to create and display multiple choice questions and answer choices from a JSON file. The complete app would allows organizations to build and host their multiple choice exams/quizzes and users could register to take them. However, no backend for this to be possible is implemented for this project. It is more of a proof of concept with focus on the front-end and AngualrJS templates, controllers, routes, services, and directives to create a funcional web app. View portfolio for more samples of my work or contact me if you're interested in working together.